and both my grand children are a GIFT to me . I wrote my journaling straight onto the TAG . You had the best time celebrating your 13th birthday in 2010, lots of fun and laughter. I had fun wrapping this page like a gift . We wished for a beautiful grand daughter and our wish came true . always remember you are a GIFT TO US. Such gorgeours layouts!! Love the idea of wrapping on the last one!! 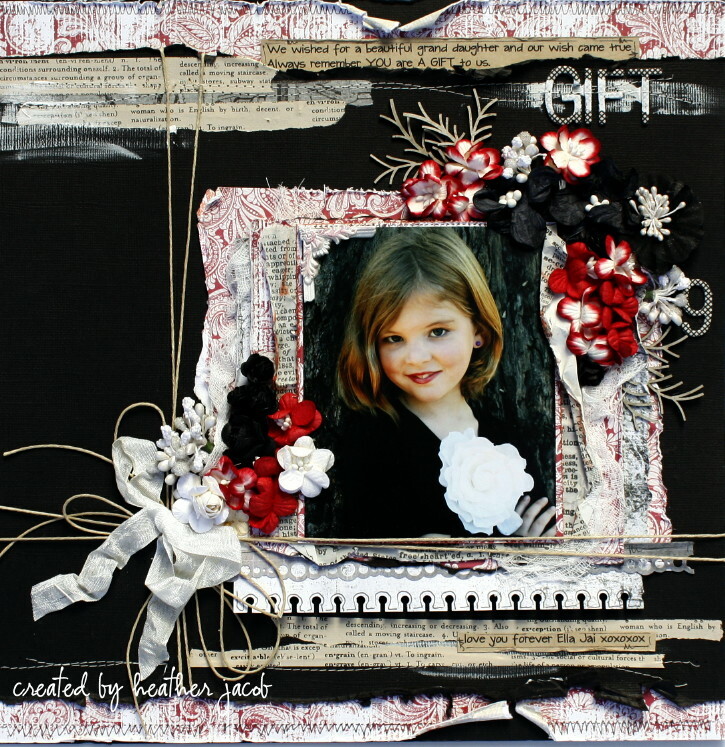 I love each layout individually and the idea of one for each grandchild is beautiful. Really Heather i don't know how you do it!! 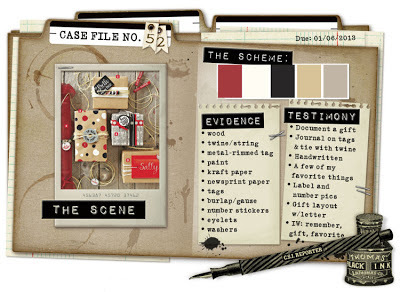 -Creating lo's one more fab than the other,...AND you make it look easy too. Stunning creations my friend!! Happy New Year!! Both are amazing Heather! Your creativity and sense of detail always fill me with awe!!! Oh Heather these are fabulous! Love both....the first so manly and the second so pretty! Awesome take on the challenge! These are absolutely GORGEOUS!! I loveeeeeeeeeeee the colors, the layers and loving how you used the film strip on the first one!!! They are both truly gorgeous! How wonderful to see you can make two very different lay-outs with the same colour combo. They are both just fabulous! Both are beautiful pages with cool details and layers. Both absolutely gorgeous layouts! 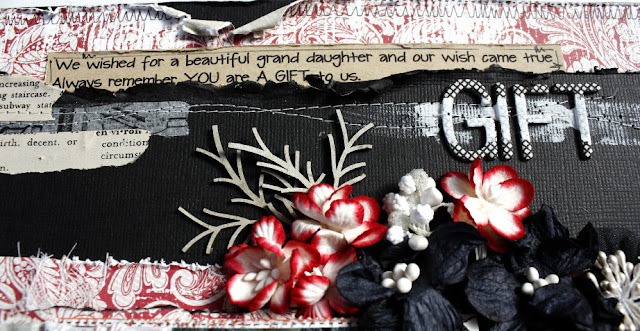 Kids are certainly a gift :) I love your layers, stitching, inking...everything really! Beautiful photos too. WOW WOW WOW!!! You never fail to amaze me with your creativeness Heather!! two stunning Layouts Heather!! amazing work!!! Oh wow Heather, your talent for scrapping is a gift too I think.. really love these, the first one is rugged and masculine, and the second bold yet pretty... love your scraps! Happy New Year to you! I just love your details on your LO's! And love the colors on these to! Thank you so much for your great comment in my blog, over my top 10 AJ's! I love it! These colors are fantastic and so are your pages ! I wish you a very happy new year, health and love with your family. Hi Heather - just wanted to send a note to WISH YOU A HAPPY NEW YEAR and to THANK YOU for sharing your fabulous creations - they are all so very, very inspiring. Looking forward to what you unfold in 2013! So beautiful Heather. 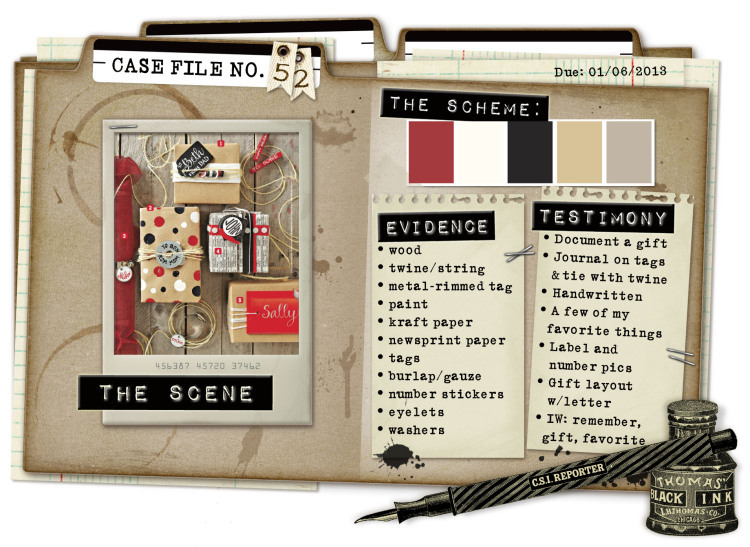 I really love the red design, what an amazing masculine layout and the gift wrapping on your second layout is brilliant! Great design! Amazing pages!! Love the bold colors and gorgeous details! Gorgeous gorgeous gorgeous - your work always just leaves me in awe! It is such a wonderful gift you are sharing with the rest of the world - your creativity! We are so many who stop dead in our tracks when we see your work, always in awe of the obvious talent. These are gorgeous pages Heather, bold and strong and just full of everything that is uniquely you. Marvellous layouts! mwah mwah mwah!